Mary Lou McDonald said she would “lead from the front” in dealing with such issues if elected leader of the party. 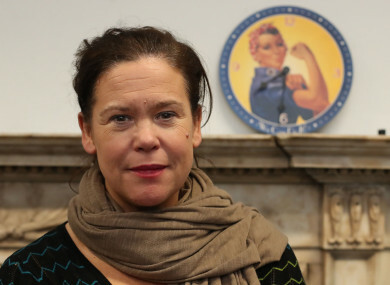 MARY LOU MCDONALD has said that her aim would be to create a “respectful, friendly, comfortable, professional relationship” within Sinn Féin if she is elected its new leader. The party is set to elect its new leader in February and, as the likely successor to Gerry Adams, McDonald was quizzed on RTÉ’s Morning Ireland today about the recent resignations in the party and the allegations of bullying from some quarters. Two Galway-based Sinn Féin politicians – Senator Trevor Ó Clochartaigh and Councillor Gabe Cronnelly – stood down from the party last week. Cronnelly said he was resigning due to “ongoing unrest around the way the party is dealing with unethical behaviour”. Ó Clochartaigh, meanwhile, cited the “inaction” by the party in dealing with “ongoing disciplinary issues” within the party organisation in his constituency. There have been a spate of resignations from Sinn Féin recently, with allegations of bullying repeatedly cited as the reason. Speaking today, McDonald said that she would “lead from the front” in creating the respectful, friendly party she envisages, and would insist that every member of the party is “aware and au fait” with the rules of the party. McDonald said that every case was different but that “sadly some members have not felt they have had the satisfaction they wanted” in a number of instances. The Dublin Central TD said that, of those who have stepped down from the party, she knows most of them “pretty well”. She said: “I am very conscious of the fact that our party has grown very substantially and very quickly, particularly in what is called the south. That has been a huge boom for our politics. It’s brought energy and positivity, but it’s brought some challenges too. “They are good people,” she said. “They are the best of the best. [They want] us to shape up and deal with issues as they arise… in a more timely way. She said that nobody in the party had been “gotten rid of” and there are procedures in place to deal with complaints and grievances within the party. McDonald added that it was normal for an organisation going through significant growth to have such issues cropping up from time to time. When it was put to her that there are parallels between Sinn Féin’s handling of bullying claims to the way the gardaí allegedly smeared Sergeant Maurice McCabe, she added that such a suggestion “trivialises” the issues related to McCabe’s case. Email “McDonald says grassroots members want Sinn Féin to 'shape up' in dealing with bullying claims”. Feedback on “McDonald says grassroots members want Sinn Féin to 'shape up' in dealing with bullying claims”.